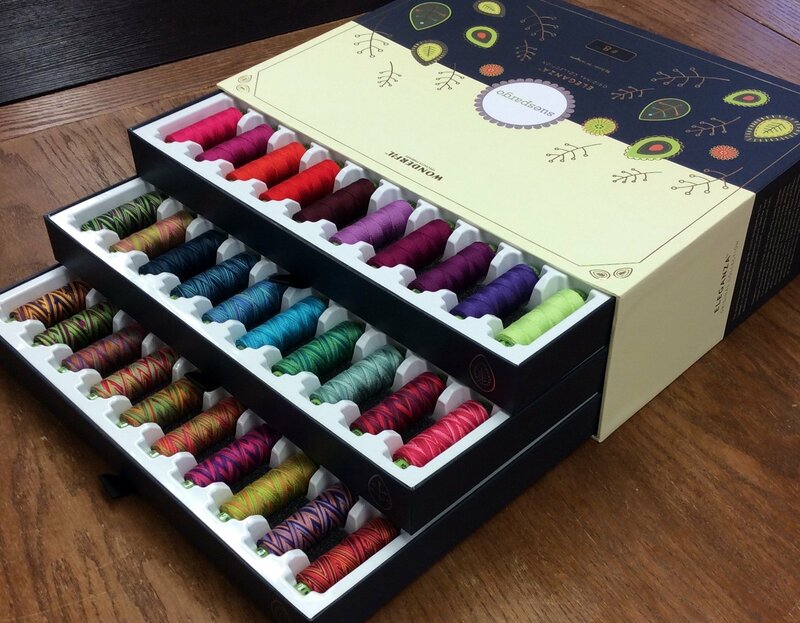 Sue Spargo's original 90 color line of Eleganza Perle Cotton Size 8 is now available as a boxed collection. It is presented in a designer three-drawer box with ribbon pulls and is designed to meet the specific needs of hand stitchers, embroiderers and embellishers. Eleganza is made from 100% Giza 88, the highest caliber extra long staple Egyptian cotton. Fibers spun with this fiber create a thread of extreme softness, strength and luster. An extra 15% twist has been incorporated into the design of Eleganza resulting in a thread of superior stability, uniformity and sewability. Eleganza is double gassed and mercerized to eliminate build up of lint and snub, largely enriching the appeal of stitchery. Sue has designed a bright, saturated color palette along with a unique line of variegates. Eleganza's collection of variegates contain extra short variegations in order to provide rapid color change on small scale designs.